With the widespread availability of used P71 Ford Crown Victorias, it seems like having a retired police car is not so cool anymore.. at least, cool in the sense of being unusual. So it’s a fun surprise to find an older semi-plainclothes patrol car, even if it does mean putting up with a wheezing smog-era GM V6. Replacing the Nova police package in 1979, the 9C1 option did not include any kind of power upgrade t othe engine, but smaller cars like this were more commonly used in urban areas, where maneuverability and fuel economy were prized over top speed. 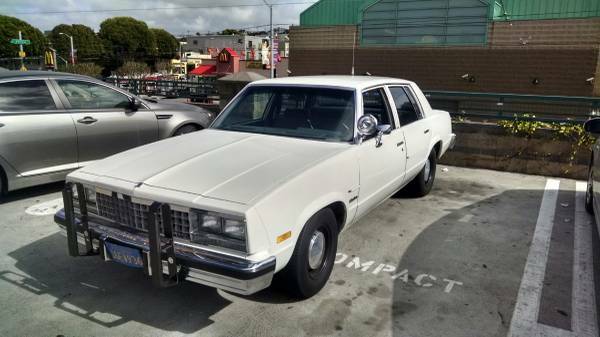 Check out this 1983 Chevrolet Malibu 9C1 for sale for $3000 in San Francisco, CA. By this point, you’d expect a 32-year-old police vehicle to be faded and beaten up, but this one seems to have survived in very good shape – better than most contemporary civilian versions of the car. Weight on a standard sedan is about 3200 lb., so with 110hp acceleration should be leisurely – you’re not going to see the far side of 100mph on a flat surface. Curiously, to see any kind of change in that figure, you have to skip the 267 V8 and go straight to the 305. The 350 was also offered in Mexico, and no doubt there are plenty of aftermarket choices to improve that side of things. But the cool thing about this car is that it does look to be in good, untouched condition – nobody’s yet followed the well-trodden SBC/rally wheels path. So what could you do with it? Scare 1980s criminals? Rent it out for movies? Use it as the cornerstone for your “cars of Magnum PI” collection? It looks to have around 36,000 miles, so there’s a lot of life in it yet – with those pusher bars, maybe it’s a good car to move other less-functional cars, or for parking in tight spots. Perhaps this is the conundrum the seller has failed to address. 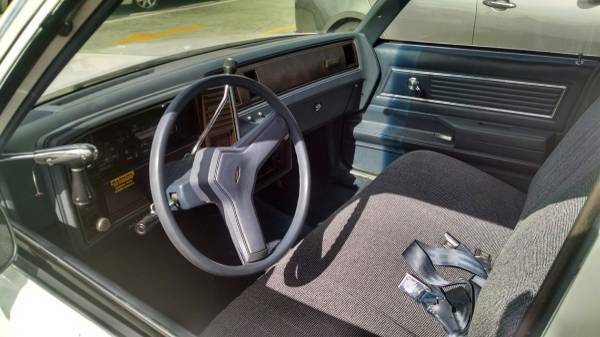 The interior looks right for a patrol car, only not as beaten up as it should be. Interestingly, it doesn’t have the usual line underneath the speedo about it being calibrated. The spotlight is nice if you’re lost in a dark neighborhood. 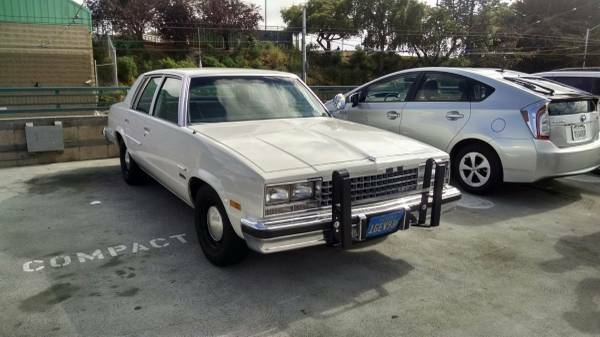 And if that doesn’t tickle your fancy, how about this 1983 Chevrolet Malibu sedan delivery? This entry was posted on May 21, 2015 at 10:42 am and is filed under Feature. You can follow any responses to this entry through the RSS 2.0 feed. You can leave a response, or trackback from your own site. For $3k, its really a no-brainer even if all you are looking for is transportation. Add the cool factor and this is a definite winner.